Since I knew I’d be super busy this week, I stopped by Trader Joe’s on Monday to stock up on ready-to-eat meals. I grabbed some old favorites as well as some new products and they have been helping me squeeze in quick but healthy lunches and dinners. 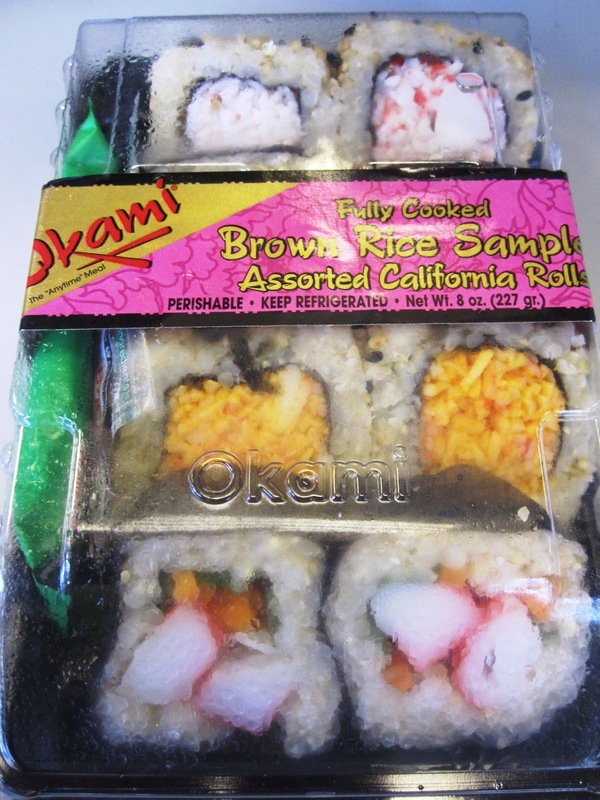 For lunch on Tuesday I had an old favorite – Trader Joe’s packaged sushi. I guess the brand is Okami, but I always just consider it Trader Joe’s. There are a bunch of different varieties, and this one was actually new to me. Each package is around 400 – 500 calories and comes with soy sauce, ginger, and wasabi. I combined mine with an apple for a filling lunch. The sushi has never been dry – always fresh and delicious! 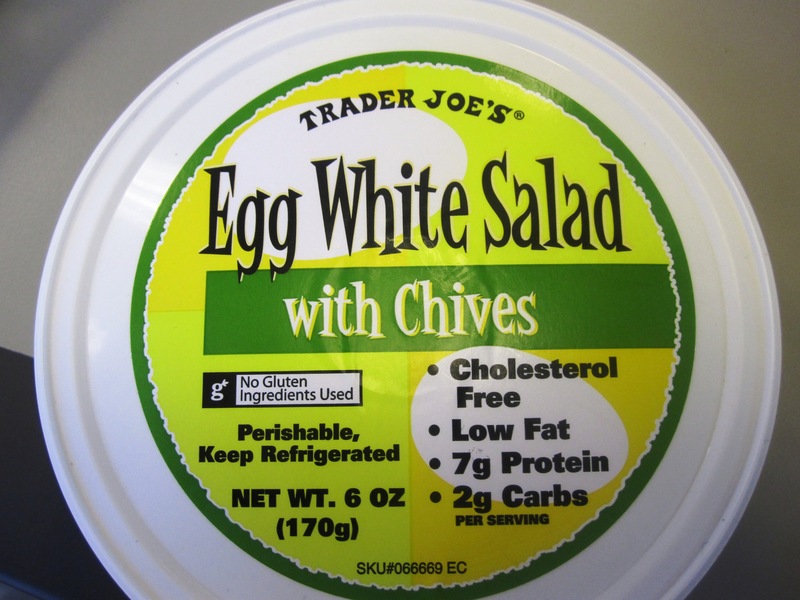 For dinner I tried a new-to-me Trader Joe’s product, Egg White Salad. I had heard good things about it and loved that it would be an easy way to get in protein. 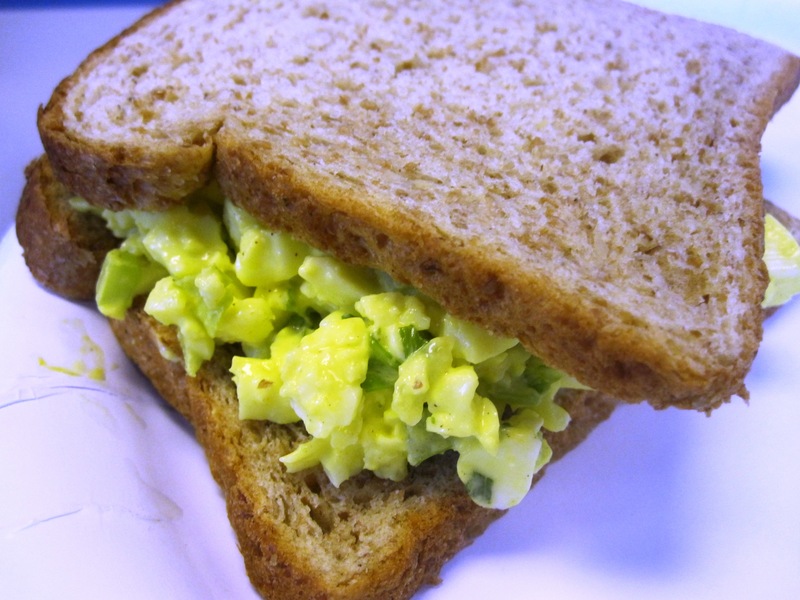 The salad was a fun neon color and tasted great both on bread as a sandwich and on its own. I wish that I had bought another container – I want more already! 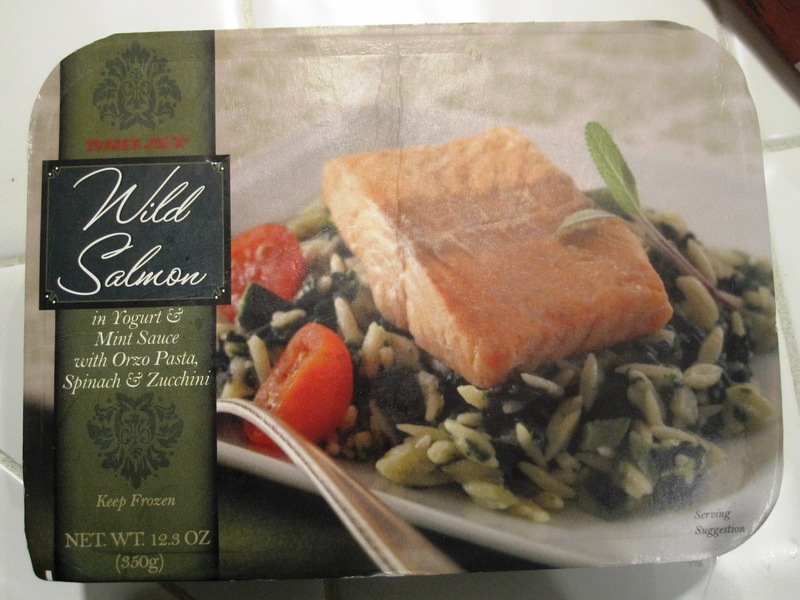 Moving on to Wednesday, lunch was TJ’s frozen Wild Salmon. Lunch was provided at work, but of course there was not a single vegetarian option. It’s a good thing I planned ahead – but really I’d rather have salmon and orzo than some lettuce and tomato wrap they came up with anyway. 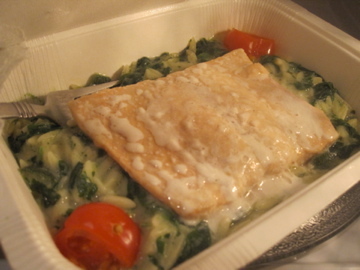 The salmon was cooked really well, but my favorite part was the slightly creamy orzo. It was a good sized portion of it too! I want to eat more seafood but buying fresh isn’t always practical with my schedule and budget. This is a great option to keep on hand! 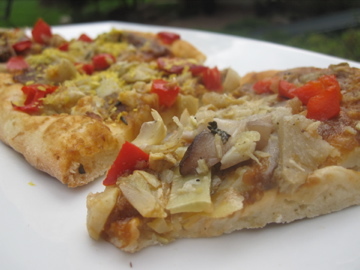 Thursday night’s dinner was one I was looking forward too – Roasted Vegetable Pizza. I was looking at this in the store and an older woman spoke up to tell me how much she loved it! I popped it in the oven for 8 minutes and then sliced it into two servings – one for dinner and one for tomorrow’s lunch. It smelled incredible and the vegetables were a-plenty which automatically gets two thumbs up. 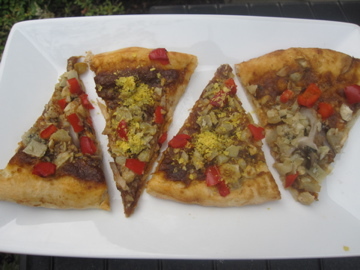 I added a sprinkle of nutritional yeast to two of the slices for some added protein. It tasted great, but the pizza by no means needed it. 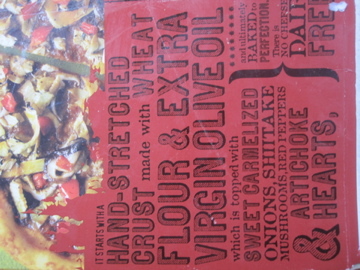 I took one bite and fell in love – so doughy and covered in perfectly sauteed onions, peppers, artichokes, and mushrooms. I was really sad when it was over. I will 100% be buying this again. I realize I left out my Wednesday dinner and Thursday lunch. These weren’t Trader Joe’s meals but instead I utilized a buy-one-get-on salad coupon at Crazy Bowls and Wraps. I’d never had a salad there and they had some new ones on the menu. 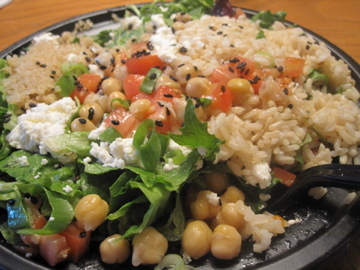 I LOVED the grains salad that I had for dinner which came with chickpeas, feta, quinoa, brown rice, and a tahini sauce. I like to have some carbs in my salads other wise I don’t feel full. 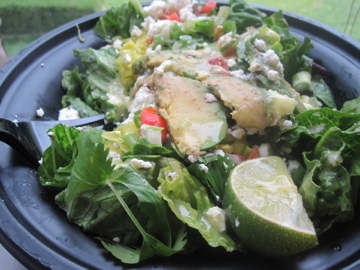 And the second salad was equally as delicious with avocado, feta, chickpeas, pepperocinis, and my favorite jalepeno cilantro vinaigrette. Both great options, but it’s always hard for me to veer away from my favorite tofu veggie bowl. So that’s what I ate all week! I don’t usually like to rely on frozen and pre-made meals, but for really busy time these are some fantastic options. What’s your favorite frozen or pre-made meal for when you’re in a pinch? What’s your all-time favorite Trader Joe’s meal? I think I NEED to go to TJ’s tomorrow! It’s about a 25 minute drive (and I take forever to do ANYTHING with my broken ankle), but after seeing all these items I think it will be worth the effort! TJ’s BBQ Chicken Salad wins by a landslide for an easy-to-grab meal! LOOOVE it. 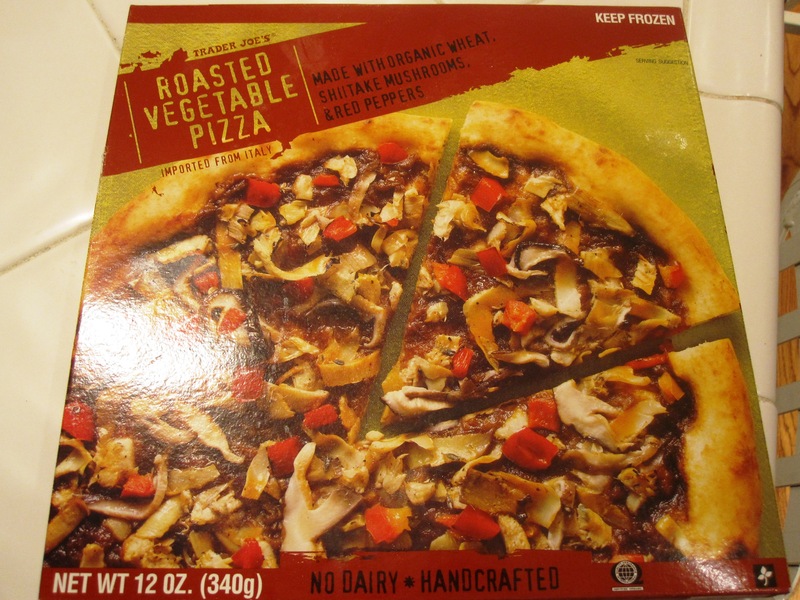 i have one of those roasted veggie pizzas in my freezer but i haven’t tried it yet! eek, now i’m excited for it. I think I need to dive in a little bit more when I go to TJs.. I have a certain list of things I get.. and kind of ignore the rest. Time for that to change! Those are all new to me TJ’s products–I can’t wait to try the salmon. My fave TJ’s frozen meal is their frozen quinoa mix. It has huge chunks of red and green peppers and it’s really filling! Darn- I just went to TJ’s and actually looked at that pizza but decided not to get it!!! Was it filling enough? It felt really light when I picked it up. I love TJ’s almond milk- it’s really thick and creamy. I love that TJ’s pizza, too! I just tried it for the first time last week and I agree: it is GOOD. My bf (who’s a pizza-with-cheese kind of guy) even loved it. Sadly, when I went to TJ’s yesterday it wasn’t in stock so I’m hoping this isn’t a fleeting product! So I got to try some frozen “healthy” burritos from EVOL because I won a free voucher thingy….they sucked! I could barely choke them down. But I do love frozen dumplings! They are the best frozen foods because you don’t even have to defrost them, just dunk them in boiling water. And so many ppl I’ve heard don’t like TJs sushi. But it really is an easy option when there’s not much else to go to. That all looks so good! I wish Memphis had a Trader Joe’s. I would spend so much time in there! I go to the one in Nashville whenever I’m up there. I haven’t had much from the frozen section- it all looks so good, but a three hour drive is a little long for frozen goods to stay frozen. The one thing I have had, the meatless meatballs, were delicious. And both of those salads look great. I wish we had a place like that too! a total TJs lover! I’ve never had that pizza but it looks delish! Ive had their mini reduced guilt one but the one you had looks way better! I love their broccoli slaw and Asian sesame dressing! So good! Or their frozen quinoa is amazing, as is the rice medley that has brown rice and barley. If I need a quick frozen meal I like their black bean enchiladas or the veggie lasagna! this makes me really sad about my lack of TJ’s! oh the meals I’m missing out on…like that salmon..so good! I need to find that pizza next time I hit up TJ’s! One of my favorite frozen meals in a crunch is a pizza that has goat cheese, roasted red peppers, red onions, and I can’t remember the other toppings or the brand but it is tasty! lol.